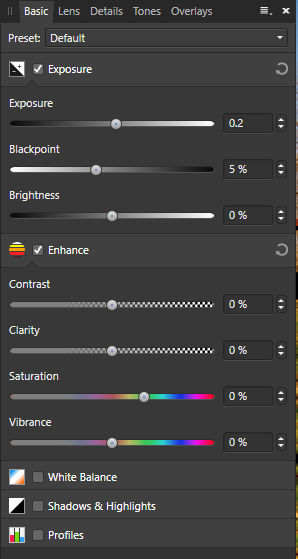 I have been using Affinity Photo since mid 2017 and overall love the program but do have some issues with the UI, especially the RAW engine develop mode. Exposure has this nice slider with an edit box containing 2 digit precision which is extremely helpful. My complaint is that things like Blackpoint go black very fast in full 1% increments, so why don't we have the same 2 digit precision control for the other sliders too? Having retired from the programming profession after over 30 years, I know for a fact that although 0 to 100% may be the range, creating a double precision floating point variable to control it is not rocket science. I like very precise control in RAW development. At the moment (for 18 months now), I've been forced to export into TIFF and bring back in for any semblance of control over such rudimentary features. Please consider putting in those boxes and give your users the ability to precisely control these aspects of the RAW development process. It would surely shorten my workflow.